MainAll NewsForeign AffairsItalian Islamist Cell "Planned Attacks in Israel"
Italian Islamist Cell "Planned Attacks in Israel"
Italian police still searching for two other suspects. Italian police arrested four men on Tuesday, who are suspected of planning terrorist attacks in Italy, the US and Israel, reports Reuters News. One of the arrested men is believed to be a Tunisian former imam at a mosque in the city of Andria, in the southern Italian region of Puglia, where police said the terror cell was based. According to paramilitary police, the men aimed to train terrorists and send them to fight abroad, and are suspected of conspiracy to commit international terrorism and incite racial hatred. According to investigators, the four men focused their recruitment activities among illegal immigrants, who were subsequently sent to training camps in Iraq, Afghanistan, Yemen and Chechnya. Police described the group as being characterized by "fierce anti-Semitism and anti-Western sentiment" and an aversion to states viewed as enemies in the context of religious war. 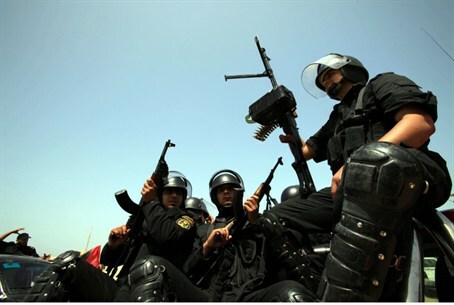 Authorities further claimed that at least some of the new recruits to the cell carried out attacks in Iraq. Police are searching for two other men who are believed to have taken part in the cell's activities. The pair are thought to have fled to Tunisia, although no international arrest warrant has yet been issued. The fact that the Russian territory of Chechnya featured as one of the places where the cell's jihadi recruits were sent for training will be seen as significant, given the "Chechnyan connection" of the Boston Bombers - Dzhokhar and Tamerlan Tsarnaev. Tamerlan is believed to have spent time in Chechnya and neighbouring Dagestan, as part of his ideological journey towards Islamism. Chechnya was for more than a decade the scene of a bloody insurgency against Russian control by ethnic Chechens, a largely secular uprising which was later seized upon as a cause for "holy war" by Islamist extremists or "mujahideen." These included a terrorist attack in a Moscow theater in 2012 and the massacre of hundreds of schoolchildren in Beslan in 2004. Today the conflict has subsided, but Islamist groups still operate in the territory, carrying out occasional attacks against Russian targets. Chechen Islamist units are also widely believed to be taking part in fighting in Syria against the Assad regime.